4Points Academy is a private elementary and middle school program opening this fall in Steiner Ranch. The program will be initially hosted at the IQuest Enrichment Center, with plans for a new expanded space in 2017. The program’s Founders have backgrounds in engineering, education, law, and business. The Founders are supported by a team of highly qualified advisors, including educators and business professionals, who advise on the curriculum and other aspects of the program. The Academy’s teachers/instructors are skilled educators that bring a depth of experience to the program. The Academy’s mission is to provide a robust and adaptive academic curriculum, with (i) small class sizes to promote true differentiation, based on each student’s academic ability, (ii) full integration of technology, and (iii) teacher-guided instruction that ensures each child receives instruction that meets and enhances the child’s academic abilities. Under the Academy’s adaptive curriculum model, every child will acquire mastery of class grade material (and is expected to perform above state and national standards). Children who are academically advanced will be provided a learning path that appropriately challenges that child at his/her advanced academic level so that the child continues to be instructed and to acquire knowledge at their intellectual pace. Entering children who are behind in one or more subject areas receive instruction and additional teacher focus to enable that child to be quickly brought back to grade level before progressing ahead. The program’s core subjects’ curriculum has been tested and utilized, with great success, at schools across the country. The specific methodology utilized in applying the curriculum enables each child to grow in confidence and academic achievement while allowing the teachers greater opportunity to spend time guiding each child along their academic learning path. 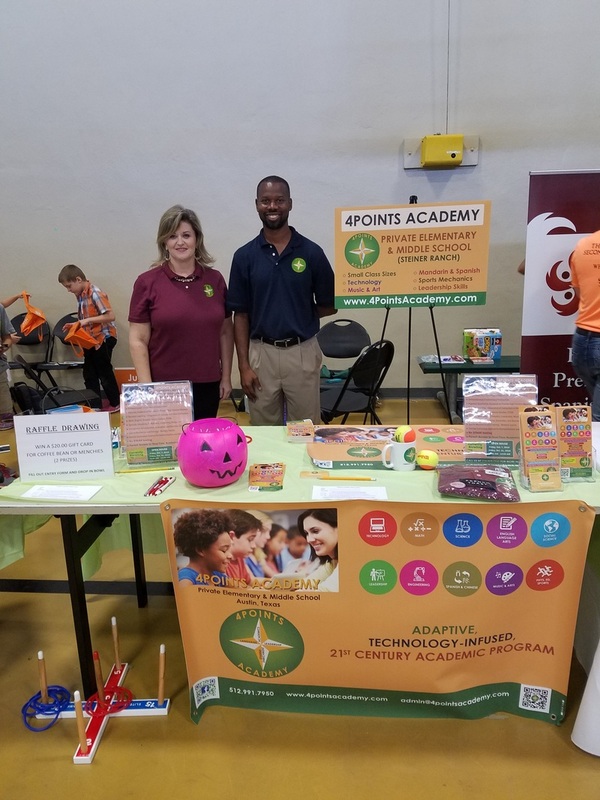 Lead Teacher, Lisa Modur, with founder, Eustace Isidore, at Austin Private School Fair. With small class sizes, the Academy aims to foster and build a real community that truly cares for each child. Our philosophy and approach to community building will enable the kids to build confidence, develop compassion and empathy for others, exhibit commitment to their academic goals and build courage to pursue their goals. In addition to the core curriculum subjects, the Academy offers instruction in Mandarin and Spanish, Creative Expressions, including Music and Art, IT/Robotics/Engineering, Sports Mechanics, and Leadership and Business development. The foreign language program aims at building proficiency in reading, writing, and speaking for children who remain in the program for several years. The sports program, under the directorship of five-time Olympian, Sandie Richards, a Jamaican track and field athlete and Texas Women’s Athletics Hall of Honor Inductee at the University of Texas, will focus on developing fundamental skills and mechanics across a variety of sports for all students. ​Why start a new school in Four Points? “As parents of two young children, we have researched various options (both public and private) available in and around Four Points, Lakeway, the North 620 corridor, and as far as central Austin,” said Eustace. “None of the programs met the various needs we felt were important. We were seeking a school that provided a well-rounded education, that would teach children at their academic level, regardless of age, and that included foreign languages, other enrichment options, and sports instruction. We quickly realized that the area needed a school that could focus on the academic needs of the individual child, with a curriculum and class setting conducive to providing instruction that is tailored to meet each child’s needs,” he said. “We are really excited to offer this program in the Four Points area. There are good public school options in this area. However, even with the best of intentions, it is hard for teachers to truly provide differentiated instruction that reaches each child where they are at when there are 18 or more kids in a classroom,” said Eustace. The Academy will keep its classes small enough to give the teachers true flexibility and will offer a curriculum that is robust and tested. "Importantly, as a private school, our children will not be subjected to the anxieties of having to sit for the STAAR test, but will be educated to perform above the state levels of such standardized exams. Our parents will be provided progress reports that allow them to follow their child’s academic progress," he said. In addition to its full curriculum offerings, foreign languages, Music/Art/Robotics/IT enrichment, leadership & business, and sports mechanics program for its regular full time students, the Academy offers a flexible schedule for those who are actively involved in Sports and other high commitment activities (e.g. participants in tennis, golf, dance, swimming, and gymnastics, etc. ), as well as students who travel (occasionally and/or frequently) during the academic year. We also offer a custom schedule for home schoolers who desire a more robust curriculum with access to real teachers and/or languages and other enrichment subjects (music, art., IT/robotics, Phys. Ed.) during the school day. The Sports Mechanics program of 4Points Academy held three installments of its Running Drills and Mechanics (RDM) Clinic in Steiner during the summer months. Kids attending the camp were instructed on running techniques that will enable them to run more efficiently and increase their overall speed. This increase in speed is also helpful for those participating in other sports, particularly football, soccer, softball, lacrosse, tennis, etal. One of the Clinic’s repeat participants was recognized as “Viper of the Day” by the Vandergrift high school football coaches for his ability to correctly perform one of the running drills during one of the Viper’s summer football camp. 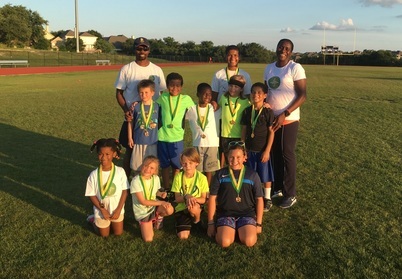 Some of the clinic participants are featured i the picture with clinic coach, Eustace Isidore, a former collegiate track and field athlete, and Director Sandie Richards, 5xOlympian and former World Champion track and field athlete, and UT Hall of Farmer. 4Points Academy held its inaugural Running Drills and Mechanics (RDM) clinic in Steiner Ranch the week of June 6th - 10th and its second clinic the week of June 20th. The clinics' participants were taught a variety of drills and exercises that provide the foundation to developing proper technique when running. Understanding proper technique and mechanics is essential to developing the foundation that enables young athletes to excel in sports. Our sports program focuses on teaching key skills that young athletes need in order to obtain a competitive advantage over their peers as they participate in team and individual sports. ​Three clinics were held over the summer. The inaugural clinic, held in June, featured a special appearance by the Sports Director, Sandie Richards, who handed out medals to each participant. Sandie, a 5x Olympian and winner of multiple World Championship and Olympic medals, brought one of her Olympic medals for the participants and their parents to see and hold.